Do you get tired of traditional weights and machines? Are your workouts getting old and stale? Are you ready to break out of the mold and take your workouts to another level? Not too long ago, while working out at my local gym, I noticed something strange out of the corner of my eye. At first, I wasn't sure I saw what I thought I saw. So I looked up in the mirror so I could get a good look at what was going on covertly. And sure enough, it happened again. There was a dude lying on a bench facing the ceiling. He had a 10 pound dumbbell in each hand. He lowered the dumbbells to his chest and gingerly tossed them into the air - maybe 6 inches or so. After catching them, he would repeat the motion. Now, I can't discount that he was somehow cheating a broken nose so that he could work on his hand-eye coordination. The fact is, medicine ball exercises are a great change of pace in your otherwise boring workouts. Just the variety of adding a few medicine ball exercises alone they add to your workouts can take your body to the next level. And for those looking to build sport specific muscle and power, the medicine ball provides many options. After all, can you imagine throwing a dumbbell to your partner or off the gym wall? Or up in the air above your face? Me neither. What is a Medicine Ball, Anyway? A medicine ball is a type of exercise ball that is approximately 14 inches (35.6 centimeters) in diameter and comes in various weights ranging from 2 to 25 pounds (0.91 to 11.34 kilograms). Here's the simple facts: Having more fat than you want can destroy your self confidence. Transform Your Body by Burning Fat and Building Muscle? Medicine ball exercises can help improve your dynamic flexibility and help increase your overall range of motion. By increasing your range of motion, you are able to incorporate more muscle fibers in your muscle building routines. This helps you to build muscle faster so that you have a faster, more efficient metabolism. Medicine ball exercises allow you to build muscle faster is by helping to increase your explosiveness. Training for explosiveness is called plyometric training. By incorporating some plyometric exercises in your workout plans you will increase the amount of weight you can handle. The more weight you can lift, the more muscle fibers that are used, which leads to increased muscle mass. Increased muscle mass leads to faster fat burning and a longer, leander sexier look. The medicine ball is an easy way to incorporate resistance training into your abdominal workouts. Medicine ball exercises can easily be incorporated into a circuit training program. Because many of the exercises are full body, explosive (plyometric) type exercises that raise the heart rate, they help you to enter the fat burning sweet spot faster. Finally, medicine ball exercises are a creative (and cheap) way to add resistance to your home workout routines when no other weights are available. What Other Ways Are Medicine Ball Exercises Useful? Medicine ball exercises are a great way to build sport specific strength and explosiveness. Because of the ease of use, and the ability to throw (and catch) the medicine ball, you can more easily simulate the motion of your favorite sport. For example, the twisting motion of swinging a baseball bat, golf club, or tennis racket, or the explosiveness of jumping for a rebound in basketball. What are the Best Medicine Ball Exercises? Don't forget to check you the medicine ball workouts that use the medicine ball exercises listed below. Begin by standing with your feet shoulder width apart and the medicine ball held with your arms locked over head (see figure 1). In a controlled motion, move the ball laterally to the right, bending slightly at your waist. Return the ball to overhead and repeat to the left side. Start on your knees with your upper body held upright, holding the medicine ball at chest level (see figure 2). 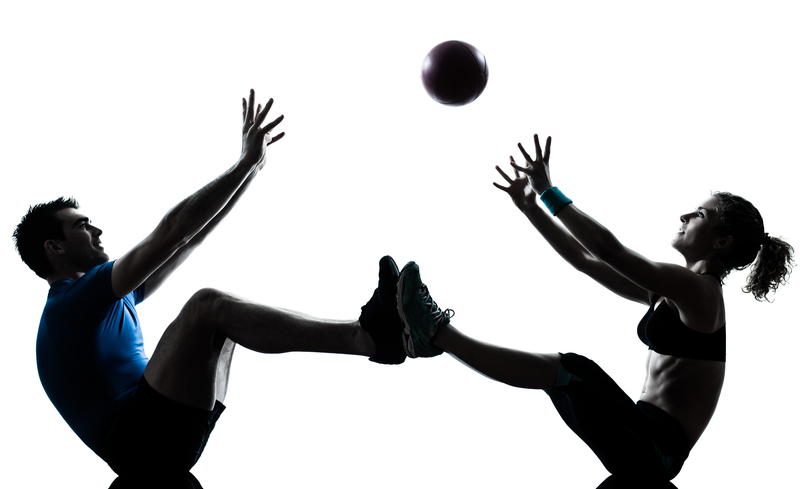 While falling forward, chest pass the medicine ball to your partner or against a wall. Continue the forward motion, falling to the floor in the push up position (on your knees). Immediately complete a push up and return to the starting position. Variation: Instead of starting with the ball at chest level, start with the ball held overhead. Advanced Technique: Explode back to the starting position while having your partner throw the ball back to you. Start by standing upright with the medicine ball above and behind your ear. Make a chopping motion by moving the ball from the starting position across your body diagonally, ending near the opposite knee. Finish the repetition by returning the ball to the starting position by reversing the motion. After completing several reps, repeat the exercise on the opposite side. Advanced Technique: For an increased range of motion, rotate your back foot while completing the exercise. Finish the repetition by returning the ball to the starting position by reversing the motion. Begin by standing upright with your feet shoulder width apart. Hold the medicine ball at chest level with your arms fully extended in front of you. Squat down, keeping your eyes facing forward, until you thighs are parallel to the floor. Hold for a second and return to the starting position. Variation: Start with the medicine ball at your chest and press either up (above your head) or out (laterally from the body) as you squat down. Return the ball to your chest as you return to the standing position. Start by standing upright, holding the ball at chest level in front of you with arms fully extended. Squat down on one leg, keeping the ball out in front of you and parallel to the floor to act as a counterbalance. Your free leg should be held rigid out in front of you as you squat (see figure 5). Variation: Start with the medicine ball at your chest and press out (laterally from the body) as you squat down. Return the ball to your chest as you return to the standing position. Begin by standing with the medicine ball held at your waist (approximately at belly button height). Take a step forward with one leg, lowering yourself until the top of your leg is parallel to the floor. Make sure that your knee does not extend past your toes to avoid injury. Either return to the starting position and repeat the movement with the opposite leg, or perform a "walking" lunge by continuing forward by alternating legs and "walking" across the floor. Begin by standing with your feet slightly wider than shoulder width apart and your knees slightly bent. Hold the medicine ball above your head. Throw the ball forcefully down on the ground, making sure to pull down with your abdominals on the downward throwing motion. Catch the ball and return to the starting position. Advanced Technique: For an added challenge, you can perform this exercise with one arm at a time. Catch the ball on the bounce and repeat with the other arm. Start by standing upright, holding the ball above your left shoulder with arms extended (at approximately the same level as your ear). Taking the ball from the left ear diagonally across the body toward your right knee (similar to the diagonal chop in figure 3 above). Now move the ball straight up to your right ear. Then again, diagonally toward your left knee. Finally take the ball back to the starting position at your left ear. Tip: Think of this exercises like a combination of diagonal chops. Advanced Technique: For an added challenge, you can use a ball with a string and handle attached (shown in picture). Start in the push up position with the medicine beneath one hand and the other hand on the floor. Advanced Technique: As you become more powerful (and comfortable with this exercise, attempt to generate enough force on the push up to move the ball from one hand to the other during the push up. Begin by lying with you back on the floor with your knees bent. Hold the medicine ball against your chest with both hands. Hold the crunch position for a count of one, squeezing the abdominals tight. Lower yourself to the starting position, keeping your shoulder blades approximately 1 inch from the floor. Begin by standing upright and facing a wall. You should be approximately an arms length away from the wall. Hold the ball above you head. Begin by throwing the ball against the wall from this position and catching it on the return bounce. As you become more comfortable with the move, you can bend your arms back (away from the wall) to throw the ball with more force against the wall. Advanced Technique: This medicine ball exercise can also be done with one arm. Start by standing upright with your feet slightly wider than shoulder width. Hold the ball near your left hip (you will be throwing to the right,initially). Begin the throwing motion by moving the ball across your body from your left hip to your right shoulder, transfering weight from your left foot to your right foot. Finish the throw with you weight over your right foot. Variation: Instead of starting the throw at the opposite hip, you can also start it at the opposite shoulder. Variation: Some people throw the ball off a wall and catch it. 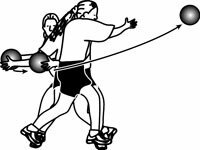 Others (like myself) prefer to turn it into a complete fat burning workout by thorowing the ball as far as possible, sprinting to it and throwing it back in the opposite direction. This is known as the Hammer Throw and Sprint. Begin by sitting on the ground facing your partner. You should be between 4 and 6 feet apart. The person holding the ball should lie down while holding the ball overhead. Perform a sit-up, keeping the ball above your head and throwing it to you partner as you contract your abdominals at the top of your sit-up. You should aim for slightly above your partner's head on the throw. Your partner should catch the ball, and repeat steps 2 and 3. Variation: If you do not have a partner, you can perform this medicine ball exercise by throwing the ball against a wall, catching it, and repeating the movement. Variation: If you are not yet strong enough to do the move with the ball held over your head, you can hold it at your chest and perform a chest pass to your partner on the sit-up. This is exercise pictured at the top of this post! Start by standing upright with your feet shoulder width apart. Hold the ball snuggly against your torso. Twist your upper body in either direction, keeping your feet firmly planted. Hold the position, flexing the oblique muscle for a count of one. Repeat the move to the other side. Begin by standing (or sitting) in an upright position. Using both hands, hold the ball behind your head. In a controlled motion, extend your arms upward, keeping your upper arms stationary. Flex your triceps for a count of one before lowering the medicine ball back to the starting position. Start by standing in an upright position. The medicine ball should be held at your naval with you arms straight. Keeping your arms extended, raise the ball until it is parallel to the ground. Hold for a count, and return the ball to the starting postion. Begin by standing with you feet shoulder width apart. Hold the ball at waist level just behind your right hip. Swing the ball across your body to the left side. Repeat the move in the opposite direction. Tip: Keep you abdominals tight throughout the movement. Advanced: As you twist, shift your weight to your front leg (the side with the ball) and lift your back leg slightly off the ground. Medicine ball exercises provide a unique and exciting challenges you your workout plans. As a result, choosing the best medicine ball exercises can help take you to the next level in achieving your build muscle and burn fat goals!